A common question from first-time visitors is “How do you pronounce the name of this place?” It seems people have been asking that for years. The earliest record of the island’s name, on a map made by English explorer John White in 1585, designates the inlet as “Wokokon.” Subsequent spellings include “Woccocock,” “Oakacock” and “Okercock.” The name derives from the Woccon tribe of Native Americans, who lived in the mainland tidewater and established fishing and hunting outposts on the island. The inlet, the island and the village now all carry the name Ocracoke, which, incidentally, is pronounced like the vegetable and the soft drink. One of the expeditions Sir Walter Raleigh sponsored between 1584 and 1587 landed here, and in 1715, a little more than a century after Jamestown was settled, the North Carolinian colonial assembly saw fit to pass an act placing pilots on the island. Many colonists lamented the hazards of the changing shoals of Ocracoke inlet, and the first residents guided boats over the shallow bar. The isolated inlet was also prone to smuggling. 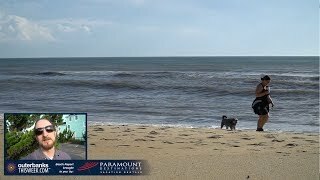 One man in particular was comfortable navigating the waters of Pamlico Sound, and in 1718 Edward Teach, or Blackbeard, was caught and beheaded as he and his ship hid in waters behind the island. After the pirate’s death, people were more willing to settle, and by the time of the first census in 1790, 135 whites, two free persons of color and 31 slaves lived on Ocracoke, NC. There were 23 households and nine family names, most of which remain prominent: Bragg, Garrish, Gaskins, Howard, Jackson, Neale (in the 1800 census amended to O’Neal), Salter, Scarborough and Williams. Early settlers kept livestock, fished and grew vegetables. The men piloted locally or worked on merchant ships traveling routes from New York to the West Indies. Through the Revolutionary and Civil wars remarkably little seems to have changed. During the Revolutionary War the shifting sands that had confounded early settlers enabled seafarers to foil the British Blockade. During the Civil War the Outer Banks quickly fell to Union Troops. Apparently islanders went about business as usual in spite of the occupying army. By 1860 the island was able to support several grocers and carpenters. Although the majority of men remained seafarers, more and more had begun fishing for a living, and some worked for the U.S. Life Saving Service. The Woccon Indians, who once came to indulge during the summer, were trendsetters of a sort. 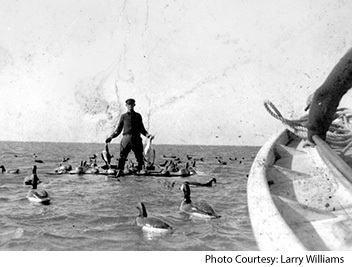 In the later 1800s wealthy mainland families began fleeing the marshy tidewater to summer on the island, and guided hunting and fishing trips gained popularity as vacations. 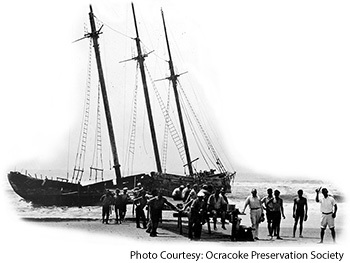 The development of steam power had diminished Ocracoke, NC’s, importance as a port, and islanders adapted their skills to the changing economy. Though there was fledgling tourism, a clam processing plant on the island had closed, and the 1920s and 1930s saw an exodus of people to the ports of Newport News and Philadelphia, where jobs were more abundant. 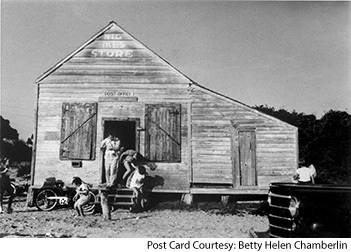 After World War II, a growing middle class found its way to Ocracoke, NC. The Navy had paved the first road and deepened Cockle Creek, which was given the more picturesque name of Silver Lake. More changes took place in the second half of the 20th century than at any other time in the island’s settled history. Throughout the 1950s the village’s roads were gradually paved. A National Park Service Seashore was established in 1953, including everything but the 775 acres of village on the northwest side of the island. Prior to 1956 all telephone calls had to be made or received at the Coast Guard Station. 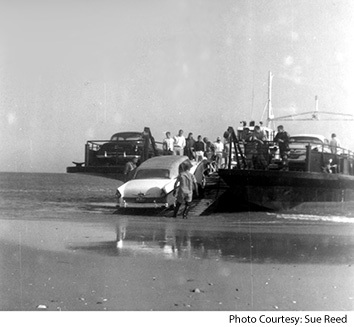 In 1957 North Carolina bought the four-car ferry that Mr. Frazier Peele ran between Ocracoke and Hattteras, and in the early 1960s the state purchased the vessel Sea Level, which traveled the Cedar Island route. In 1977 a water system provided an alternative to cisterns and hand pumps. Tourism now dominates the economy, and each year the number of visitors increases. 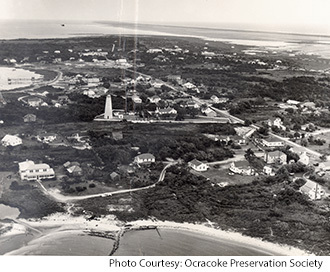 Despite all this rapid change, Ocracoke continues to enchant, as much for its populace as for its natural beauty. Many natives still speak with a distinctive brogue, or dialect, and Ocracokers know how to tell a story. It’s a necessary skill: The year-round population is at an all-time high of about 800, winters can be full of chilly nor’easters and diversions many take for granted don’t exist here. 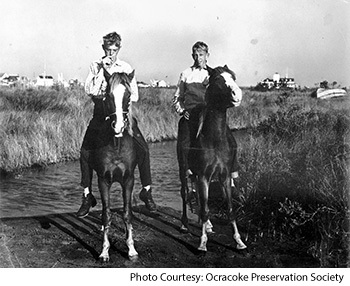 Though Ocracoke is an insular community, Ocracokers themselves are warmly generous and welcome sincere interest in their lives. The island has wide sandy beaches with clean blue water, making it the perfect spot to throw out a fishing line or dig your feet in the sand or read a book. A stroll from one end of the village to the other takes perhaps 30 minutes, and bicycles are the ideal transportation. Kids can sign up for surfing lessons or safely explore the village on their own. Kayaking the sounds or wandering the national park makes for great birding and shelling. One can rake for clams then steam them on a beach fire. You can charter a boat and head offshore after the big one. Or you can just meander around town, visiting the distinct shops and galleries. (Go ahead, take a picture of yourself in front of the lighthouse.) On Ocracoke, it’s okay to have a nap in a hammock, a cold beer in the middle of a hot day, or both. At sunset you can sail past Teach’s Hole before dining on fresh seafood. After a few days on the island, you’re likely to recognize some faces. At the post office you might bump into the person who served you dinner, or you may strike up a conversation with a local shopkeeper over a morning bagel. Ocracoke, NC, is a small town. This guide will introduce you to the neighborhood, even if you are only on the island for a short time.